SPECS: Steel, black finish. Fits semi-automatic AR-15/M16 receivers with .154" diameter hammer and trigger pin holes. May be installed in AR-style .308 rifles that accept AR-15 triggers. Does not fit HK416 weapons with firing pin safety. Kit includes trigger andhammer assemblies, springs, hammer pin, tube of grease, and illustrated instructions. This trigger replaced the standard trigger on my Remington R-25 308. It is the best trigger I've ever had on any firearm. It was easy to install and has a significant difference in the group sizes of this well shooting gun. With this trigger, groups hover around the .5MOA mark with 175 GMM and hand loads out to 200 yards which is as far as I've had a chance to test it. The trigger made a huge difference! Geissele's products are very good as a rule but this is just the sweetest marksman's trigger I have ever used. they have outdone themselves.It is probably too light for tactical use, but if you want super touch with a smooth and natural follow through this thing is just about as good as it gets, regardless of platform. I am using this on a DPMS AP 4 and it is so much smoother than the factory trigger. It is very light so be careful choosing your application. I absolute love this trigger! So I'm not really used to the flat trigger having not fired the rifle yet. I'm not sure if I like it as of yet. I'll decide after some range time. The first stage is very consistent. There is a light break you can feel. I'm not sure about the reset as of now not having fired the rifle yet, but this trigger feel much better than the triggers you get with the lower parts kits when dry firing. I also have an enhanced trigger with a lower parts kit from Spikes. This trigger is better than both of those. With the Spikes trigger I, had to put lower weight springs on the lower receiver to lessen the trigger weight to make the trigger bearable. Stock triggers just feel awful. 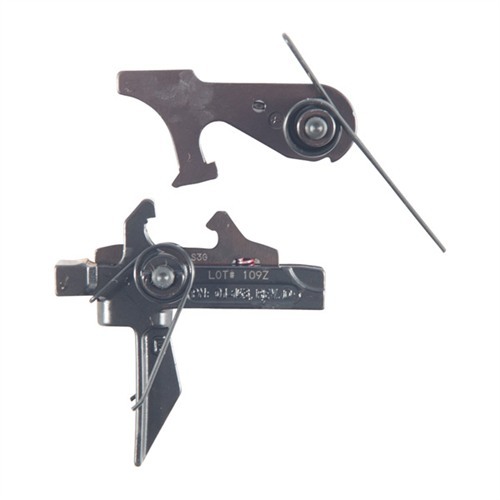 These triggers are pricey but a must upgrade to accurize your rifle along with a quality barrel. The break is too light if you are using your rifle for combat uses. The Super Dynamic would be a better choice for CQB, but the SD-E is good for lower stress target use. I bought this for a target AR-15 and was disappointed with my choice. I first time at the range I had the lighter spring installed. Imagine my surprise at going full auto (or so I thought). The reset on this trigger is so short and the spring so light that I rolled off an 7 or 8 shot bump fire (much to the concern of the range safety officer). I installed the heavier spring (4-1/2 I think) and that cut down on the accidental bump firing but I still have to pay attention to my grip to avoid double shots. Overall a crisp trigger that breaks like glass but beware of how you apply it. I have only had experience with mil-spec stock triggers and wanted a change. I did my research and decided to buy once cry once. The 240 price is steep but after the first shot all my tears were gone! Smooth pull breaks like glass. I just ordered a 2nd one when i saw that it was on sale. I really like this trigger for a hunting rifle. The light take up and crisp break are awesome and it's very safe for a rifle I carry in the woods and swamp. I like my Timney, but this is a better option for me and it took no time to make the adjustment from single stage to two stage. The Flat trigger is what made me try it, I think it works better with big hands. A fine trigger at the bench, an outstanding trigger for extremely fine work where instantaneous break completely controlled fire is needed. I own two and use mine on what are the equivalent of high-power AR platform space guns in .223 Rem for PDs out to about 500 yards off tripods and sticks. Small intermittently moving targets off only marginally stable rests. The trigger must break the instant that you think is should. These deliver. Also a good trigger for shooting standing on your hind legs, same requirements. The SD Enhanced is slightly but noticeably better than their similar slightly cheaper curved trigger two stage trigger which is a good trigger in it's own right. I have never had a bump- fire in well over 5000 rounds. Acquire the target, take up the slack of the first stage, adjust the sight picture for perfect, this trigger breaks almost unconsciously in the middle of the thought that it's time. This is my second Geiselle trigger. I previously owned the G2S, which is an absolutely amazing trigger given the price tag, which is why when I saw the SD-E on sale I had to jump on it. I will say that the aesthetic look of this trigger is what initially drew me towards it. I've never used a flat trigger before and frankly I didn't notice a whole lot of difference in feel so don't worry about purchasing a trigger that feels shockingly different. Installation took me less than 10 minutes. I put the lower on a lower vise block, locked it up on my vise, and went to work. This comes with a slave pin which makes installation super easy! Geiselle also includes their trigger pins and a sticker and patch. Let's talk trigger break: Comparing this to the G2S the first stage is super smooth. It's a much more refined version of the G2S. The entire first stage is uniform and stops at the wall. The break is super light and very crisp. For precision AR shooting this is definitely the trigger you want to use! You haven't used a combat trigger this good. If you've paid as much or more for a 'target' trigger...it MAY be as good as the SD-C. What it ISN'T is as reliable and tough as the SD-C. Tons of sear overlap...more drop safe than a std mil spec trigger group....there is no downside. The flat trigger blade has been moved 1/8" forward of the sear disconnect line....giving you more leverage. This makes the 4.5lb pull FEEL lighter than it is. Super crisp 2nd stage. Great for distance, but I can slap through it at close range better than any mil spec trigger. I can almost slap through it like my buddy's competition G34. It's THAT fast at close range. It just as crisp as my Remmy 700. Just an amazing group. This trigger by far is the best drop-in trigger I have ever used in a Combat/Personal Defense AR. I ordered another one for another AR and will order more as soon as money allows. Watch Bill Geissele's video on YouTube for installation (wish he had some better close-ups, but the video and instructions that come with the trigger make it a breeze to take out your old trigger and install the Super Dynamic Geissele Combat). Personally I think the SD-E (Enhanced) would be too light for a Combat/Personal Defense Gun, but that is just my personal opinion and what Bill Geissele recommends. I also really like the flat-faced 1911 style trigger - better feel and a lighter pull than you would expect. It is also set back, so you still have plenty of room in the trigger guard for a gloved finger and/or an enhanced bolt release mechanism (Something I was initially concerned about, but is a non-issue). In short, the Geissele is the Gold Standard of Triggers. If you want a solid, sweet, dependable/repeatable trigger for personal defense, hunting and target shooting, I highly recommend the SD-C Geissele. And as usual, if you are not 100% satisfied with it, Brownells will refund your money! It doesn't get any better than that! I absolutely love this trigger. Smooth and crisp at the range shooting paper, but rugged and reliable if things get ugly. I did a lot of research before I "pulled the trigger", and I could not be happier with my choice. Worth every penny of the substantial $$$. My father in law was good enough to put this in my Christmas stocking, and I had it installed in less than 10 minutes. A slave pin is included, and the only tool I used was my leatherman mut. After install we fired off a few rounds, and I have zero complaints. Very short travel for the first stage, and just a hair of travel to reset. It's a clean 4 pound trigger, I believe its labeled for 4 1/2 but if you place your finger in the right spot it's smooth sailing. My First Geissele Trigger and i will say, Buy into the hype. It's expensive but if you want greatness, this is it. Shot groups couldn't be tighter. This is not an ordinary trigger. There is no comparison with a stock assembly. I was doubtful about the high price, but this is well worth the money. Trigger comes with two trigger springs. 5 pound and 3.5 pound. I tried both in a very light carbine I assembled with a 16" barrel, and a standard weight bolt assembly, standard weight carbine buffer and spring and a Spike's Tactical lower. The 5# trigger is super. Single stage, clean break. I love the flat face. Installation of the hammer was a bit of a struggle as my kit didn't come with a slave pin. Used a slightly undersized punch to align the hammer and spring with the pin holes, and cocked the hammer. Then everything fell into place. I had no problems on the range. Great feel. NO creep. Very short reset. With the 3.5# spring the trigger pull actually measured a little under 3# average using Lyman electronic gauge. With the short reset and light pull this trigger will bump fire if the trigger is feathered, as the instructions warn. Easy to avoid with a little practice, but I am working on a fix to eliminate the possibility. This is my first Geissele trigger. I can honestly say this is the nicest trigger I have yet to use. I love the two stage format. The first stage is pretty short and the second stage breaks super crisp with just a little extra pressure. It blows away any single stage trigger I have used. I don't know how this stacks up to other triggers in the Super Dynamic line, but I will definitely be getting another one of these during the next sale. I highly recommend! I've primarily used Hyperfire triggers up until now. I just got the SD-C and think I may be switching all of my triggers to these (other than my pcc). The two-stage pull is much more forgiving in terms of accuracy and finding the break. I feel much more confident using this trigger in a home defense role than my Hyperfires. Also, this trigger was SO much easier to install than my Hyperfires - literally took 10 minutes from start to finish in a new lower. Geissele seems to be the gold standard for reliability and is touted throughout the industry, so I'm glad to finally join the bandwagon. And, Brownell's had hands down the best deal with both a sale price and promo code. Great fit and function. Super smooth and easy to install. Well worth the money. I was skeptical of the nearly flat trigger bow at first, but after the first few shots, I understood and actually prefer the 'flat' bow to a curved one now. I need a few more of these now. I mangled the trigger spring pretty good because I was in a hurry installing it the first time. It was after midnight Eastern time when I send an email to Geissele to see about getting a new one; got an immediate reply saying they would send me one free of charge. Installation went fine the second time. My trigger is 3.25 pounds and absolutely smooth with a really quick reset. I had to get out my trigger gauge to check it because it seemed so light. It still seems lighter than a match 3 pound two-stage trigger I have. It is much quicker shooting doubles and transitioning than the factory or match triggers I have. I plan on adding this trigger to more of my ARs. I have Geissele triggers in 2 of my 5 ARs now, upgraded from JP adjustable and JARD. I love this one. Nice short, crisp break, short reset and you can bang your rifle around all day without ever having to think about the possibility of a misfire. Comparing this to other triggers I've used this comes out on top so for anyone looking to replace a stock trigger for the first time, this is the best way to go. Installation was a snap, parts fit perfectly, instructions are clear and concise. Attention to detail is excellent, super quality construction. Trigger pull is short, resets fast, and above all smooth. One thing to mention, you need to get rounds downrange with this trigger, it is not for everyone. Once you become accustomed to its function and feel it changes the whole dynamics of the rifle. 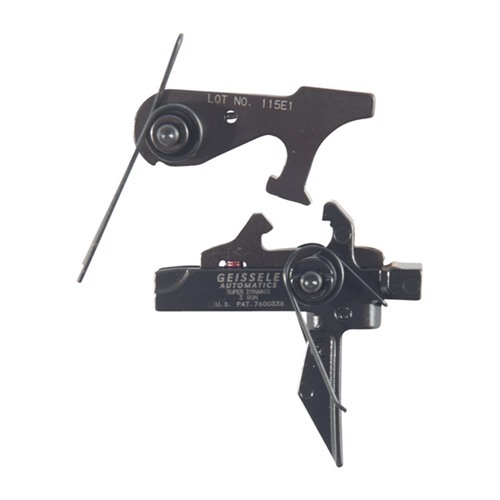 This is the best trigger I've ever purchased and it performs better and more reliably than the trigger that came on my benchrest rifle. I've installed it on my Mega MA-TEN in 338 Federal. Everyone who has ever pulled the trigger on my rifle has commented on the pull and reset. I'm now putting this on my other ARs. I have zero complaints on this trigger assembly, it is just awesome! The trigger comes with two springs, one 4 lb and one 3 lb, Im useing the 3 lb spring and love it. It pulls and breaks like glass. Also, install is very simple with an exta hand to help keep the trigger in the lower while inserting the pins. Well worth the money, you wont regret going with this set up! If your desire is to consume ammunition at the fastest rate inside of the law, this is the one. A monkey can instal it with the proper punch set. I bought this trigger for a dpms .308 rifle. The factory trigger was less than acceptable and unpleasing to shoot. After doing some research, I decided to go with this trigger. All I can say is, WOW! Fast as lightening, very little creep, and breaks like a glass rod! It was worth the money and made the rifle fun to shoot. I am always pleased to see an American Company design and manufacture a truly outstanding product that really works. Great job Geissele! From now on, this is the only AR trigger for me! I put this on my 3 gun TacOps rifle with the lighter of the two springs it came with, and while it was ok during practice, it began intermittently bump firing in a big match while I was shooting gongs at 100 yards. I nearly got a match DQ as a result. I've not had any such issue with any of my drop-in POF or adjustable JP triggers (both of which cost less), so I will probably stick with those for match guns, especially since the POF runs flawlessly in my Limited rifle, and I can't complain about my split times with it even on run 'n gun / hoser stages. If this had not bump fired while I was actively trying not to let it bump (let alone just shooting normally off-hand or braced on a stage prop), I would give it five stars, as it does have a VERY light, crisp break, and a VERY short reset. I will try it with the heavier spring to see if it runs better, but I specifically got this trigger based on its reputation and advertised lower pull weight, and I am not willing to trust a temperamental trigger in my match rifles. I do like the flat trigger, and if it breaks as cleanly and easily with the heavier spring (minus the bump), then my faith may be restored in it. I've also heard the Geissele SSA-E might be better for 3 Gun than this trigger, oddly enough, despite what the name implies. The top shooters are using stuff that's only a wee bit more expensive, and that might be a better choice too. NOTE: the upper and buffer+spring of this rifle functioned without any issues with my Limited lower and the POF trigger, so I am assuming that the bolt carrier, gas block, or other action parts/timing cannot be blamed for this issue. I am a 3 gunner and didn't start winning matches until I added this trigger to my rifle. The press is not like a long range rifle but is easy to get super fast accurate double taps and have total control doing it. There is no finer trigger for 3 gun in my opinion and I've tried several. By far my favorite trigger on the market. Comes with 2 different weight springs which is really nice cause the 3.5 is more like 3 lb. pretty easy to install. great fit and finish. Časť - Výrobcovia: 05166 854014005076 Super Dynamic (SD) spúšťa majú rovnaké telo geometria ako SSA modely a funkcie byt trigger topánku, ktorá znižuje vnímanej pull hmotnosti, zlepšuje ovládanie a dáva vynikajúce hmatové odozvy. Super Dynamic Combat (SD-C) spúšť má 2,5 lb prvej etapy a 2 libry druhej etapy celkom pull hmotnosť 4.5 lb s ostrými, opakovateľné spúšť uvoľnite. Super Dynamic Enhanced (SD-E) spúšť má kombinovanú 3,5 lb celkom pull hmotnosť, 2,3 libry prvej etapy a 1,2/m2 druhá fáza. Super Dynamic 3-Gun (SD - 3G) jednostupňové spúšť má 3,5 lb pull hmotnosti s krátke pull dĺžka a krátky reset - vynikajúci pre rýchlu akciu súťaží. Časť - Výrobcovia: 05165 854014005069 Super Dynamic (SD) spúšťa majú rovnaké telo geometria ako SSA modely a funkcie byt trigger topánku, ktorá znižuje vnímanej pull hmotnosti, zlepšuje ovládanie a dáva vynikajúce hmatové odozvy. Super Dynamic Combat (SD-C) spúšť má 2,5 lb prvej etapy a 2 libry druhej etapy celkom pull hmotnosť 4.5 lb s ostrými, opakovateľné spúšť uvoľnite. Super Dynamic Enhanced (SD-E) spúšť má kombinovanú 3,5 lb celkom pull hmotnosť, 2,3 libry prvej etapy a 1,2/m2 druhá fáza. Super Dynamic 3-Gun (SD - 3G) jednostupňové spúšť má 3,5 lb pull hmotnosti s krátke pull dĺžka a krátky reset - vynikajúci pre rýchlu akciu súťaží. Časť - Výrobcovia: 05167 854014005151 Super Dynamic (SD) spúšťa majú rovnaké telo geometria ako SSA modely a funkcie byt trigger topánku, ktorá znižuje vnímanej pull hmotnosti, zlepšuje ovládanie a dáva vynikajúce hmatové odozvy. Super Dynamic Combat (SD-C) spúšť má 2,5 lb prvej etapy a 2 libry druhej etapy celkom pull hmotnosť 4.5 lb s ostrými, opakovateľné spúšť uvoľnite. Super Dynamic Enhanced (SD-E) spúšť má kombinovanú 3,5 lb celkom pull hmotnosť, 2,3 libry prvej etapy a 1,2/m2 druhá fáza. Super Dynamic 3-Gun (SD - 3G) jednostupňové spúšť má 3,5 lb pull hmotnosti s krátke pull dĺžka a krátky reset - vynikajúci pre rýchlu akciu súťaží.